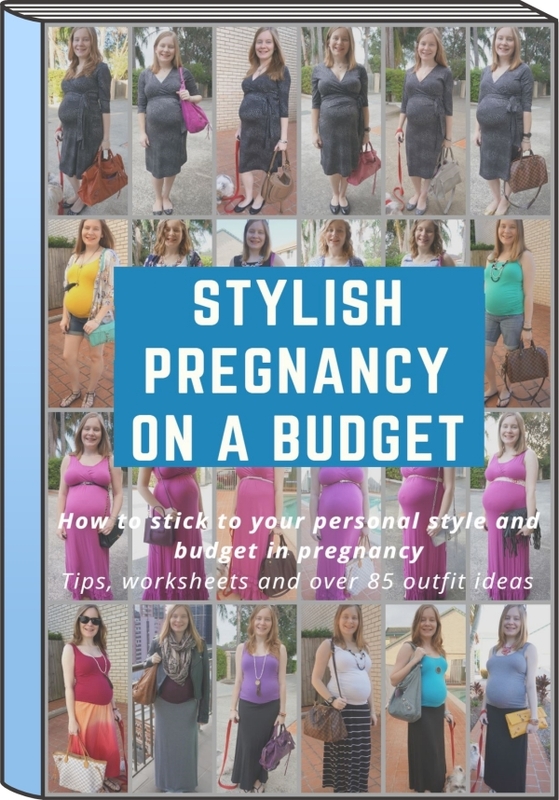 Away From Blue | Aussie Mum Style, Away From The Blue Jeans Rut: How to Have a Stylish Pregnancy On a Budget: eBook & Giveaway! That is so exciting, Mica, congrats! I am not planning on having another baby, but if I would I'd be all over this book. So awesome, Mica! I will defs be sharing and hopefully some new mums to be out there get some good inspo! Thanks for sharing all your great pregnancy outfit ideas. No baby for me right now though! I love your blog theme about trying to get out of the blue jean rut. Such a great idea! What a lovely dress and how fab you've reworn it for such a special occasion! Many congrats on the book launch as well! It is such a great idea for expecting mums everywhere! congrats on your ebook Mica!! you look beautiful in your maxi dress! Such a pretty dress! It is so hard to feel fashionable when pregnant but you pull it off with ease! I am so proud of you!!! I cannot think of a better person to write a book about pregnancy style. You always do it so well and make it seem easy. Congrats on an awesome accomplishment! How exciting to also celebrate baby boy's birthday. What a fun time in life for you. Congratulations on your e-book Mica! And good luck to everyone! That's such a pretty look for your baby boy's first birthday party and how sweet that you also wore it when you were still carrying him. Congratulations on releasing your e-book! SO excited for you! Congrats on your ebook! So exciting! What a great news, Congrats Mica. You look adorable in this maxi dress and makeup. Congratulations on the launch! The book sounds like it contains such incredible, helpful tips for pregnant mamas and those who are planning on becoming mamas in the future, to give a better idea of what to expect. Thanks for sharing, girlie, and I hope you have a great week ahead! Mica, this is super awesome!!! You go girl! I'm so proud of you! You're taking your experiences, sharing them on the blog and now taking it to the next level! You could write several books! Because you know about so many useful things for women. I wish you much success. I'm not a mom and don't plan on being one, so I wish all that enter good luck. There is so much great inspiration here! Congratulations on this! I'll definitely be sure to share with my sister, she's due in August! I would love to win this book for myself!! Love to read and it looks like a great book!! Congrats on writing your ebook! It is a great subject and I'm sure you've done a good job. I always enjoyed seeing your pregnancy outfits, so I'd love to read this book. I can't say that I'm planning a baby, because one can't plan it... perhaps it is better to say I'm hoping for it. I've trying to get pregnant for a some time now (about a year and a half) and so far no luck. I hope you get some answers and have some good news to share soon! Congratulations on the ebook, your pregnancy outfits look wonderful! I'm not planning on getting pregnant for another few years but this will be a must-have for when I do!! Thanks for sharing, Mica and congratulations...what an accomplishment!!! SO many great ideas here. Thanks for putting the work to put this all together! Congratulations! Great idea pregnancy close were a struggle for me and having a book for inspiration is great. This is such a great E-book and congrats on becoming a mother! How exciting! What a great accomplishment girl. I love that pink dress the best I think! Oh congrats Mica. Best of luck for the future. Well you gotta be eventually thinking about being fashionable during the months of pregnancy. Really helpful. Congrats on the launch! You look fantastic! Love this style, and congrats on being a published e-author! You deserve it girl! Oh that's really cool! That's so sweet of you to put all of that into a book! I wont enter just in case I did win and took it from someone who needs it, but wanted to congratulate you on it! Wow! First, you look great. Secondly, thanks for sharing your ideas and congratulations. Also, that pink dress is gorgeous on you! A huge congrats on your first ebook, Mica! I've been following you for a while and I loved how you styled your lovely baby bump during your second pregnancy. I'm sure your ebook will help a lot of mums!! :) Well done!! Congratulations on publishing your ebook! I loved how helpful it was and to the point and am looking forward to reviewing it on my blog! Way to go! Wow congratulations on your ebook! This is exciting and I will definitely recommend to anyone I know expecting. How EXCITING! This is such a great idea. Well done! Congrats on your ebook girl!!! So useful! I know so many women struggle with maternity style! The fuchsia dress looks really good on you and I cannot believe Baby2 is already 1! Congrats on your ebook and your little one's birthday!!! So cool that you accomplished such a feat while juggling motherhood. That is truly inspiring. Congrats on the ebook launch! I enjoyed following your maternity style journey! What a pretty pink dress & looks amazing on you!! Congrats on your e-book that is something that would've been very helpful when I was pregnant and you always have the cutest style when you are expecting! You always had the cutest pregnancy style! Congrats on your ebook! So exciting! You look so wonderful in all these looks! What an exciting time and you are doing it so stylishly!! Love this post. I wish this e-book was around when i was expecting ! Oh well! Love your pink maxi and the silver sequin trimming. Enjoy your me time! Congratulations on publishing your e-book. I'm so excited for you. Thank you! I am very proud of it. And you're right, they do grow so fast! Congratulations on the book! I didn't realise you had one! Congrats on publishing your eBook! I want to win it for myself since I'm currently pregnant with #2! I'm pregnant right now! I thought I did pretty good on my first pregnancy but would love to hear some additional tips! Oh wow, good for you! I'm totally sharing this post with a pregnant coworker! Thanks so much for sharing with Fun Fashion Friday! Have a wonderful holiday weekend! Congratulations on your book - a great achievement! You should be so proud! I won't be needing the ebook anytime soon but I'm sure it will be an invaluable resource for so many mums to be! 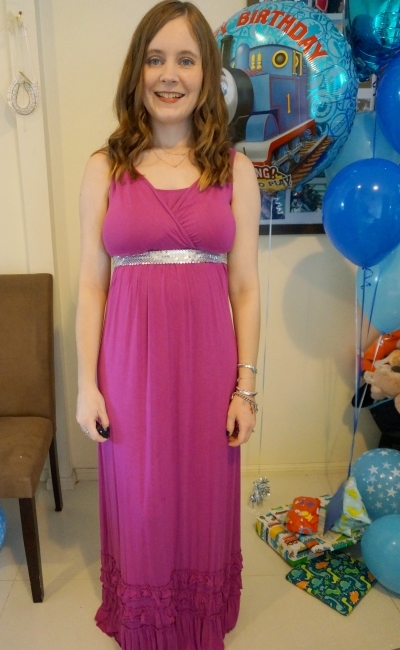 You look gorgeous in that dress, hope baby boy had a fab first birthday! Thats awesome! Congrats on your first lookbook :) All those outfits are prefect... beautiful! Maternity clothes are so different now as compared to what they used to be when I was pregnant. You look lovely. Thank you all for your sweet comments and congratulations on the eBook! I'm thrilled by all the kind words and reviews, thank you.